Now that marching season is over, I am really happy that I have time to be a part of Dancing For Cause again. I am excited to grow as a dancer and performer. I went to my first meeting of the new school year in November, and I committed to performing for the Unchained Event, despite knowing that I am behind the rest of the members and will have to catch up. I am nervous about learning everything in such a short amount of time, but the officers reassured I will be fine. We learned a new piece called “Who That Be” and the president required us to audition the piece to determine the placements. Below, I have recorded myself practicing for the audition. The president did not place me as lead, but she told me that I did really well and that she chose other people because she wants newer dancers to feel more confident and for them to experience growth. I am looking forward to performing at this Unchained Benefit performance on December 8. The practices will be long and tiring, but I love performing, and I believe it will be worth it. The performance raises awareness and raises funds for refugees trying to escape North Korea. I will post an update later, hopefully with a video of our performance! I wish that I could bottle up this feeling and relive these moments every day. All of our hard work had been rewarded. One week ago, our band did not have the full show put together. We learned the last movement in the week leading up to this area competition, which meant that we did not have time to go back over and refine the other three movements. One week ago, we were not sure if we would get a superior rating at UIL competition. One week ago, we thought that our band was bad enough to break Plano East’s streak of getting superior ratings. Today, we found out that this band will be Plano East’s fifth band to move on to the state competition. Our prelims round performance went terribly. The sun was roasting us as we performed and my feet felt like they were on fire as I moved across the football field. I was optimistic that we would make finals and hoped that we could get a chance to redeem ourselves. Out of the ten people that make finals, we placed ninth. Our director told us how unlikely that the ranking after finals vary very differently from the prelims rankings. We would have to jump four spots to make fifth place and qualify for state. The chance of making state seemed nearly impossible, so I decided that for our finals performance, I was just going to have fun. I did not even imagine that our band would actually jump four spots and become state bound. At the award ceremony, the drum majors and color guard officers represent the band. When our name was announced for fifth place, my jaw dropped. I could not believe it. I did not care that the whole stadium was looking at us, the Plano East representatives, I could not contain my shock. I am extremely exuberant and I can not wait to compete at state with the Plano East band, a band that I am extremely proud to be a part of. 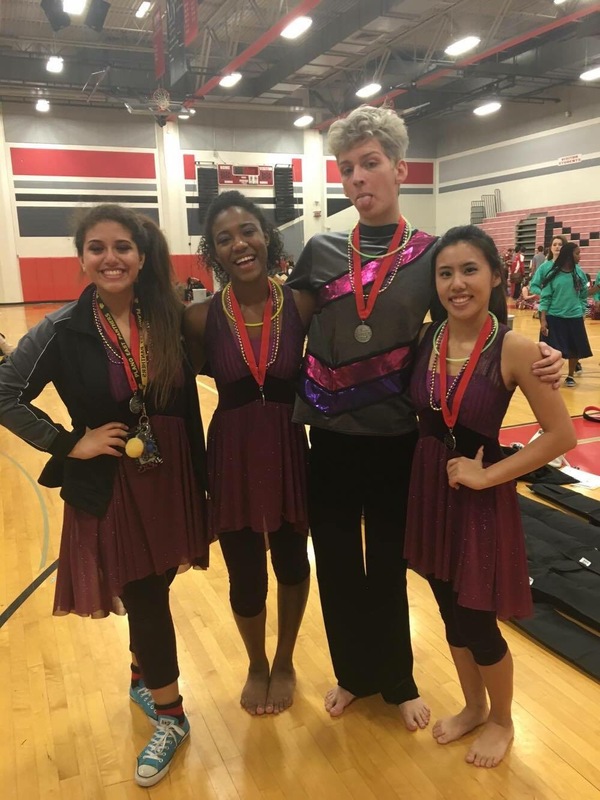 As a color guard member for two years, I have always looked up to the color guard captains. These people were not only talented in their color guard abilities, but also in their leadership skills. I had always wanted to be a color guard captain, but I never knew if I would be chosen for this position. Today I found out that the directors chose me to be color guard captain. I did not know how to celebrate the moment. I could not brag about it, but the joy that consumed me was overwhelming. My dream had come true. I have the opportunity to lead others in an activity that I am passionate with. Hopefully, I will follow my predecessors and be someone the guard will admire. Alliance is a performance team that is composed of students from multiple schools Dancing For Cause clubs. This team’s purpose is to unite people from different schools and to encourage growth in these young dancers. Many of my friends from Plano East and Plano West were on this team, and I was an audience member when they performed at World of Dance Dallas. I was moved to tears by their performance that was centered around suicide. In May, they were holding auditions for new members, and I could not wait to be a part of this team along with my friends. However, I had to make it past auditions. Auditions were gruesome. We learned a very technical and difficult piece in three hours, and then auditionees were expected to perform it in front of the directors. I loved the dance itself, but trying to remember all of the pieces after learning the moves very recently and very quickly challenged my abilities. I felt anxious and very nervous as auditions began. I ran through the choreography constantly. As I stepped into the room, I decided that I was just going to have fun, and to keep going no matter what happens. After auditioning, I felt alright about my performance because everyone felt they did badly. After I found out that I made the team, I was ecstatic! I was relieved and a bit upset when the directors said the auditions were supposed to be challenging and intentionally designed to make you want to give up. I can not wait to learn and grow along with my friends. This may not be great proof, but today I went to my first Dancing For Cause meeting, and this is the only proof I have. I had a lot of doubts about joining this club. I have several friends in this organization from Plano West and some of my good friends (including the girl who posted this video) are DFC officers at Plano East; their involvement both encouraged and discouraged me from wanting to join. I saw the great time commitment this involves, and I’m not sure if I can balance this with band. In addition, since my best friend was an officer, I figured DFC was her thing, and I didn’t want to “steal her thing.” However, I really wanted to join because it seemed like so much fun, and the DFC group forms such a tight family bond. Also, my friends were often busy at certain dance events, and couldn’t hang out with me. I figured joining the club would allow me to hang out with them while also growing through dance. It would help me in colorguard because it would strengthen my dancing skills and ability to learn combinations of moves quickly. After a lengthy discussion with one of my friends who is an officer, he reassured me that the purpose of the club is for every individual to improve his or her own dance skills. It isn’t about judgement, and the club tries to make everyone feel included no matter what skill level you are at. After going to the meeting, I can say that he was right. I felt welcome, and I’m excited to continue to participate. Although this video shows that I have no idea what I’m doing, everyone told me not to worry since it was my first time. When the camera wasn’t recording and when I was watching and learning the choreography, I felt like another person. It was almost like hip hop dancing brings out a more confident character inside of me. I’m interested to see this character develop, and I hope to be put in performances coming up later this year! 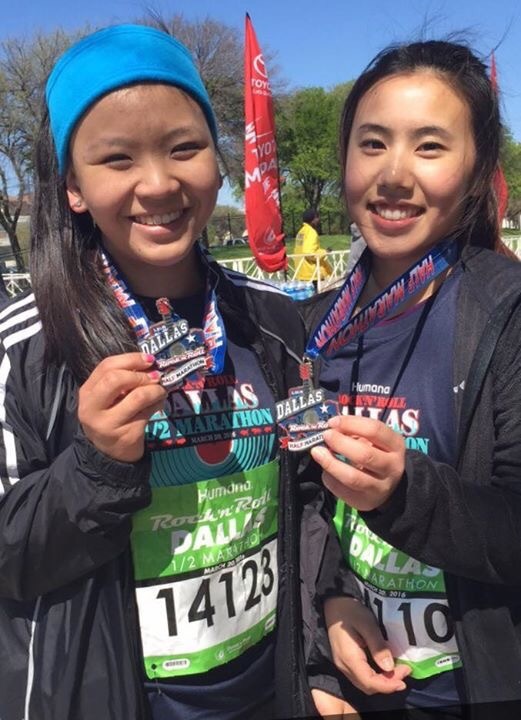 This year, my friend and I decided that we would run the Dallas Rock N’ Roll Half Marathon. We signed up because we ran it in 7th and 8th grade, and it would be fun to do again. Ever since we signed up, we were both extremely scared we would not be ready. We were right. I tried to go running every Sunday. After each run, I was both happy and disappointed. I was glad that I was motivated to actually get up and make progress on my running ability, but I was so devastated when I realized how out of shape my running had become. In 7th grade, I could run a mile in about exactly 7 minutes. Now, I’m lucky if I can run a mile in 9 minutes. In 7th grade, I rememeber having to wait for the people who ran a 9 minute mile, and now I can’t believe I’m one of those people. 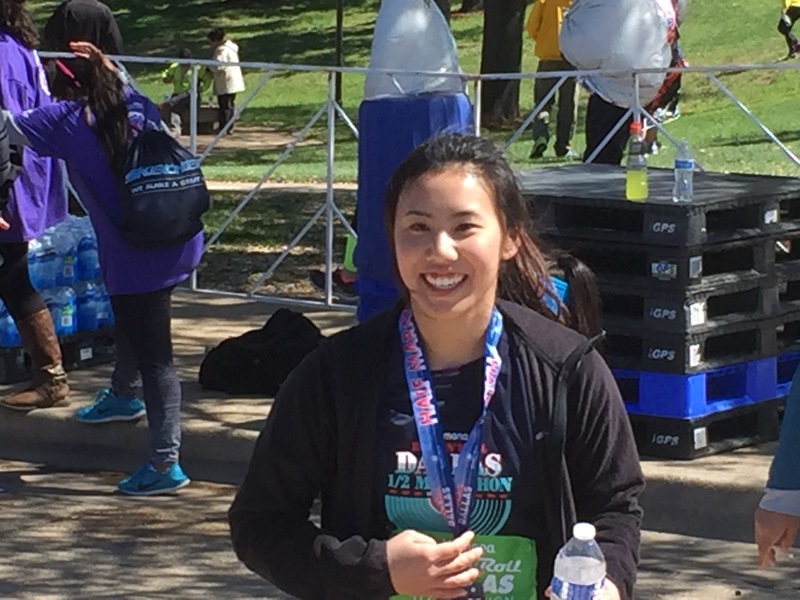 By the time the marathon came around, I still felt out of shape and unprepared, but I definitely can say that my weekly runs were better than not running at all and attempting a 13.1 mile trek. 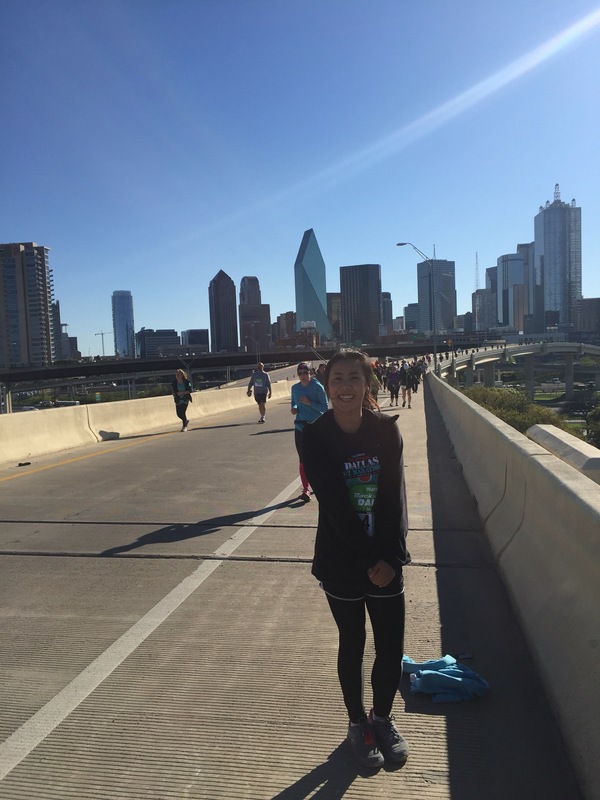 The actual half marathon was a fun experience; I can say I’m glad I did it. I loved seeing the various parts of downtown Dallas. I can say that we walked a lot more than I would have liked; I wish I could’ve ran more, but I don’t think my body could handle it. 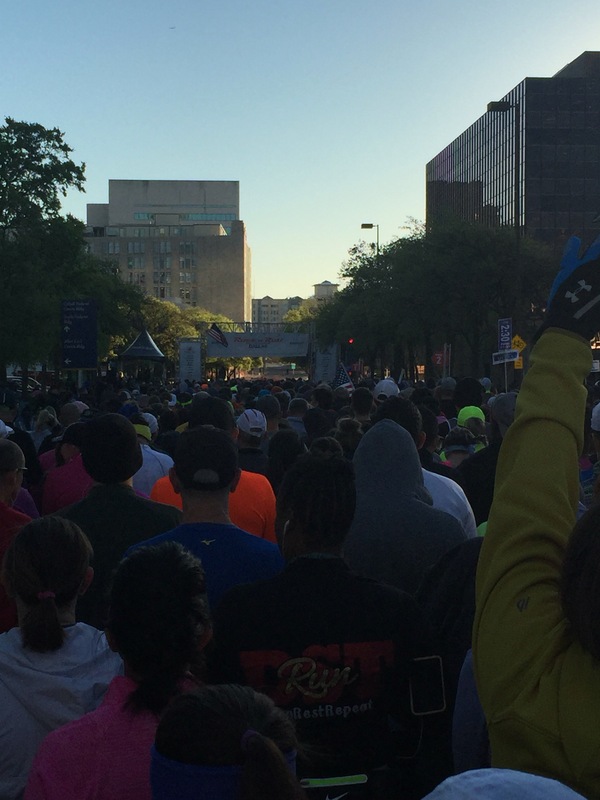 After mile 8, every time we started to run, my muscles would tense up and start to cramp. Overall, I think it was fun and worth doing. I rediscovered how much I used to love running, and I wish I could be good at it again. I’ll just have to keep running, and hopefully get a better time next year! This year for our winterguard showcase, I decided I wanted to choreograph and perform my own solo. Originally, I had no intentions of doing a solo because I felt like it would require too much work, but as the showcase approached, I talked myself into creating and performing one. My main reason for deciding to perform a solo was that I figured if I wanted to be a serious contender for colorguard captain or colorguard leadership, I should prove my skills and love for colorguard. Also, I didn’t want to be one of the few people not participating in a self-choreographed routine. Choreographing a solo was much easier than I thought it would be. I chose the song “Can’t Help Falling in Love” covered by Haley Reinhart because it’s a beautiful song, and I felt like I could really feel the song and perform to it. It took me 2 weeks to decide what moves fit in to the song, and I practiced every night. It was actually really fun; I would use it as motivation to finish homework earlier. I told myself as soon as I finished my homework, I would go work on my solo, and it motivated me to work harder. As the week of showcase rolled around, I was a bit discouraged because I realized none of my friends were able to make it to the showcase. It was the day of the March SAT, the beginning of spring break, and several other events were occurring around this time. Only a couple of my band friends and my family were able to make it, which wasn’t bad, but I really wanted to showcase my skills at showcase. When my friend told me he would record my performance, I felt uplifted and encouraged again. After I posted the video on Facebook, I got an overwhelming amount of support from my friends and family. I felt really proud of the work that I did, and I’m really glad I decided to perform a solo after all. I also feel proud that I get to show people what I do. I feel like a lot of the times I tell people I’m in colorguard, but people don’t even know what it is or how much work it takes. After seeing the video of my performance, I would have people telling me that they didn’t know that I could do that, so the greatest reward I got out of doing this solo was people’s appreciation after seeing my colorguard skills. I hope that this helps me on my journey for colorguard leadership, and I hope to do a longer and even better solo for next year’s showcase! 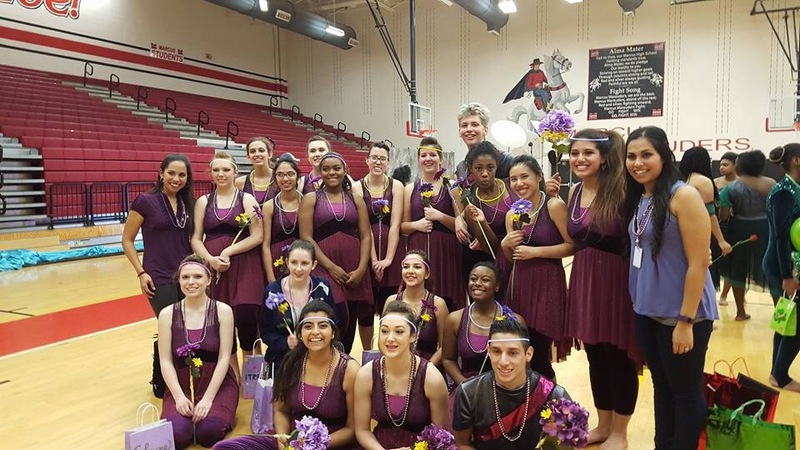 Last year, I was a part of the Plano East winterguard, and I had so much fun that I couldn’t wait to do it again this year. The only thing I wasn’t looking forward to was the long practices twice a week from 5:15-8:15 pm. Since I had done it last year, I knew how to allocate my homework, so I wouldn’t be overwhelmed every Monday and Thursday night. It’s important to me to balance the things you love and to make time for activities you enjoy. I was really excited for this season because I will be in a colorguard with my friends from marching band. Last year they split the winterguards into two groups depending on skill level, so when the director said that there will only be one big group, I was a bit worried of how that would turn out. I was impressed with how the show was written to comply with the range of skill levels, and I found myself really enjoying performing it. At the beginning of the season, we were awarded 4th place, which is one place away from a trophy. After the first competition, we got trophies at each competition. This was especially rewarding because we only got a trophy once last year, and I was glad my hard work was being rewarded with a tangible achievement. It also made me more proud to be in colorguard because we used to be a small organization that no one cared about, but we are actually good at what we do, so maybe people should start caring. 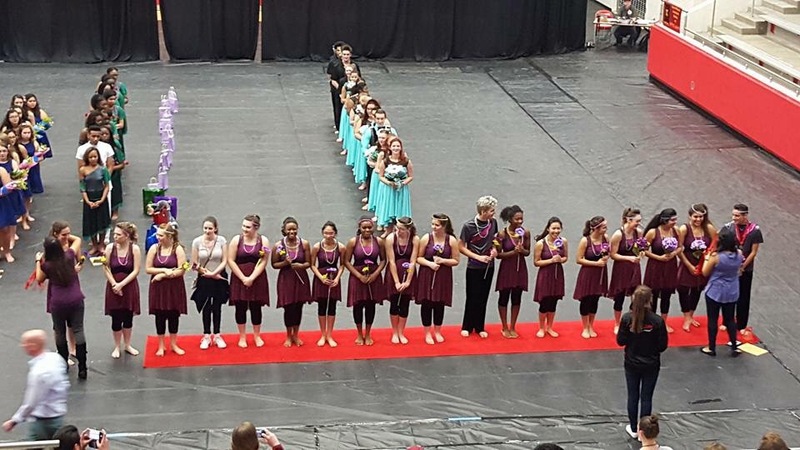 At Championships, we placed 2nd! This is especially special because we were projected to be third, but we proved ourselves worthy of a silver medal. I’m really proud of every single person I performed with. I’ll never forget this show and the memories I made during our crazy practices. The ending of the season is a bit bittersweet; on one hand, I get more free time and homework time, but on the other hand, I will miss seeing my friends twice a week. It’ll be hard, but I hope next year turns out to be even more fun, and I hope we can place 1st place at championships and earn a banner!